"Adam Frankenstein" redirects here. For the character sometimes known by this name, see Frankenstein's monster. I, Frankenstein is a 2014 Australian-American science fantasy action horror film written and directed by Stuart Beattie, based on the digital-only graphic novel by Kevin Grevioux. The film was produced by Tom Rosenberg, Gary Lucchesi, Richard Wright, Andrew Mason and Sidney Kimmel. It stars Aaron Eckhart, Bill Nighy, Yvonne Strahovski, Miranda Otto and Jai Courtney. The film brings the story of Adam, Frankenstein's monster, going on a dangerous journey and determined to stop evil demons and their ruthless leader from taking over the world. The film was released on January 24, 2014, in the United States and on March 20, 2014 in Australia. The film grossed $71 million worldwide against production budget of $65 million. In 1795, Dr. Victor Frankenstein creates a monster, a soulless creature patched together from corpses, and then rejects it, disgusted with what he has made. In a fit of rage, the creature kills Victor's wife Elizabeth and Victor chases it to the Arctic to get revenge, but succumbs to the weather. The creature buries his creator in the Frankenstein family cemetery and is then attacked by demons before being rescued by the gargoyles Ophir and Keziah, who bring it before the gargoyle queen Leonore and their commander Gideon. Leonore explains that they were created by the Archangel Michael to battle demons on Earth and protect humanity. They name the creature "Adam" and invite him to join them, but he declines and departs after being given heavy, baton-like weapons to protect himself, as more demons will come after him. The weapons allow him to "descend" demons (destroying their bodies and trapping their souls in Hell) as they have the symbol of the Gargoyle Order carved on them. Throughout the centuries, Adam fends off the demons that pursue him. During a modern-day confrontation at a nightclub, a human police officer is killed. While Adam is summoned by the gargoyles once more, the demon Helek reports that Adam is alive to his leader, the demon-prince Naberius, who is disguised as billionaire businessman Charles Wessex, and his right-hand man, Dekar. Wessex has employed scientists Terra Wade and Carl Avery to conduct experiments with reanimated corpses, and sends a group of demons led by his most formidable warrior, Zuriel, to attack the gargoyles' cathedral and capture Adam so he can unlock the secret to giving life. Before Leonore can punish Adam for the police officer's death, the cathedral is attacked and Adam convinces Ophir to release him. In the ensuing battle, a number of gargoyles, including Ophir and Keziah, are "ascended" (returned to and trapped in Heaven) while Leonore is captured and brought to an abandoned theater. Gideon is instructed to bring Adam as a trade for Leonore; Adam interrogates a demon and gains the same information. Adam having escaped, Gideon descends into the vaults and takes Victor Frankenstein's journal, which was taken off of Adam's body the night they found him. He exchanges the journal for Leonore, as it contains the secrets of the experiment. Once Gideon departs with Leonore, Adam attempts to recover the journal, but is prevented from doing so as several demons attack. Descending them, Adam then follows Zuriel to the Wessex Institute, where he learns that Naberius plans to recreate Frankenstein's experiment and use thousands of reanimated corpses as hosts for souls of the descended demons. The demons will be able to return from Hell if they have soulless bodies to possess. Adam retrieves the journal and escapes, and later confronts Terra before they are attacked by Zuriel. Adam manages to "descend" Zuriel. Adam warns the remaining gargoyles of Naberius' plan, agreeing to give them the journal if they get him and Terra to safety. Leonore agrees, but sends Gideon to kill him and retrieve the journal. After a violent fight, Adam is forced to "ascend" Gideon and then decides to burn Frankenstein's journal and destroy its secrets before the gargoyles come after him. Adam evades them, leading them to the Wessex Institute where they join battle with Naberius' demons, descending Dekar early in the fight. While the battle progresses, Adam ventures into the Institute to rescue Terra, who had been kidnapped by Naberius to put the next stage of his plan into process after he killed Avery. Naberius takes his true demonic form and activates the machine. Naberius overpowers Adam and tries to have one of the demon spirits possess him, but Adam proves immune as he has grown his own soul. As the gargoyles attempt to stop the reanimated bodies, Adam carves the symbol of the Gargoyle Order on Naberius, sanctifying his very body and utterly destroying it, descending Naberius alongside all the other demons in his army, and causing the entire building to collapse. Recognizing Adam's bravery, Leonore rescues him and Terra and forgives Adam for Gideon's death. Adam retrieves his weapons. After bidding farewell to Terra, Adam departs to begin an immortal quest to protect the humans of the world and hunt demons for selfless reasons, the attitude that had earned him his soul in the first place. In doing so, he embraces his role and his true name of "Frankenstein". Kevin Grevioux of Underworld sold the original screenplay to Lakeshore Entertainment in 2010. It is based on his Darkstorm Studios digital graphic novel of the same name. Lakeshore, an independent Los Angeles production company which also produced the Underworld films, brought Stuart Beattie on board to re-write and direct in early 2011. In November 2011, it was confirmed that filming would take place in Melbourne and that Australia's Hopscotch Features would co-produce the film with Lakeshore. It was announced on October 7, 2011 that Aaron Eckhart would play the lead role. Eckhart described his character thus: "Frankenstein is an intelligent, evolved man, and that’s how he is portrayed in this movie, for sure." In November 2011, Yvonne Strahovski was cast as the female lead, a scientist working to reanimate the dead, while Miranda Otto was cast as the queen of the gargoyles. Bill Nighy plays the film's villain, whom he described as a "Nasty piece of work; one of the angels descended with Satan." Eckhart and Otto trained for three months with martial arts experts Ron Balicki and Diana Lee Inosanto in the Filipino martial art of Kali for their fight scenes. Principal photography began on February 27, 2012, based at Docklands Studios Melbourne. Filming occurred in Victoria, Australia over a period of ten weeks, with multiple scenes being filmed at Ormond College. The film created over 500 jobs for cast and crew. The North American release was originally set for February 22, 2013, and moved from its original release date of February 22, 2013 to September 13, 2013. In February 2013, it was announced the film would be released in 3D. In April 2013 the release date was later moved from September 13, 2013, to January 24, 2014. The film saw its world premiere in Buenos Aires on January 20, 2014, after which it was released in 23 countries between January 22 and January 24. It was released in a further nine countries between January 29 and January 31. On September 17, 2013, it was announced that the film would be digitally re-mastered and released in the IMAX format. I, Frankenstein was released on DVD and Blu-ray on May 13, 2014. On Rotten Tomatoes, it has a 5% approval rating and an average score of 3.2/10. 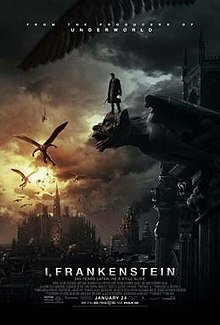 Based on 100 reviews, the general consensus is: "Loud, incoherent, and dramatically listless, I, Frankenstein is a remarkably dull fantasy adventure that fails to generate much excitement or interest in its characters." On Metacritic, the film holds a 30 (out of 100) based on 20 critics, indicating "generally unfavorable reviews". In CinemaScore poll, cinema audiences gave the film an average grade of "B" from an A+ to F scale. Mike McCahill of The Guardian gave the film 2 stars and Total Film also gave it 2 stars. Among the film's five positive reviews on Rotten Tomatoes was Ben Sachs, who said of the film "The novel premise quickly gives way to lots of chaotic action, though there are numerous incidental pleasures throughout." In the United States and Canada, the film was released in a total of 2,763 theaters of which 3D and IMAX comprised 95% of the total theaters. It earned $8.6 million in its opening weekend, which was below expectations. About 65% of the grosses came from 3D showings. Despite its disappointing opening in North America, it however had a successful opening in Russia with $6.3 million from 1,846 screens. At the end of its theatrical run, the film grossed a total of $19 million in North America and $52 million elsewhere, for a worldwide total of $71.1 million surpassing its $65 million budget. Much doubt has been cast over a sequel due to the film's lackluster box office performance, though Kevin Grevioux, creator of the graphic novel and the Underworld film series, had earlier expressed interest in making more I, Frankenstein films along with an Underworld crossover film. He stated in a pre-release interview that, in an early draft of his screenplay, Kate Beckinsale would have made a post-credits cameo appearance as Selene and that there would have been Underworld Easter eggs, but none of this was used. Subsequent releases in the series such as the fifth film titled Underworld: Blood Wars, which was released internationally on November 24, 2016, and in the United States on January 6, 2017, showed no cross-over of themes. ^ a b c "I, Frankenstein". AFI Catalog of Feature Films. Retrieved June 14, 2017. ^ "I, Frankenstein (12A)". Entertainment Film Distributors. British Board of Film Classification. January 14, 2014. Retrieved January 16, 2014. ^ a b c d "I, Frankenstein". Box Office Mojo. Retrieved March 9, 2014. ^ "I, Frankenstein Lives at Lakeshore". ComingSoon.net. February 1, 2010. Retrieved March 15, 2014. ^ Scrietta, Peter (February 1, 2010). "Lakeshore Greenlights I, Frankenstein". /Film. Retrieved March 15, 2014. ^ "Kevin Grevioux reveals the secrets of I, Frankenstein". Blastr. April 15, 2009. Retrieved March 15, 2014. ^ "I, Frankenstein Franchise Coming At You From Lakeshore". Dread Central. February 2, 2010. Retrieved March 15, 2014. ^ Miska, Brad (February 2, 2010). "Lakeshore Eyes New Franchise With I, Frankenstein". Bloody Disgusting. Retrieved March 15, 2014. ^ Fernandez, Jay A. (March 28, 2011). "Stuart Beattie to Write and Direct 'I, Frankenstein' (Exclusive)". The Hollywood Reporter. Retrieved May 3, 2014. ^ Craven, Jessica (November 9, 2011). "Gothic thriller I, Frankenstein to be filmed in Melbourne". Herald Sun. Retrieved March 4, 2012. ^ McNary, Dave (October 7, 2012). "Aaron Eckhart to lead 'I, Frankenstein'". Variety. Retrieved March 4, 2012. ^ Radish, Christina (October 14, 2011). "Aaron Eckhart Talks I, FRANKENSTEIN". Collider. Retrieved March 4, 2012. ^ Kit, Borys (November 17, 2011). "'Chuck' Star Yvonne Strahovski to Play Scientist in 'I, Frankenstein' (Exclusive)". The Hollywood Reporter. Retrieved November 18, 2011. ^ McEwan, Cameron K (February 21, 2012). "Bill Nighy talks I, Frankenstein". Den of Geek. Retrieved March 4, 2012. ^ Frater, Patrick (February 27, 2012). "I Frankenstein starts shoot". Film Business Asia. Retrieved March 4, 2012. ^ a b c "Gothic thriller starts filming in Melbourne". The Sydney Morning Herald. Australian Associated Press. February 27, 2012. Retrieved March 4, 2012. ^ "Another Glimpse at Aaron Eckhart in I, Frankenstein". Dead Central. April 19, 2012. Retrieved March 1, 2014. ^ "I, Frankenstein Moves to September, Snitch Takes Its February Spot". ComingSoon.net. Retrieved March 1, 2014. ^ Vlessing, Etan (February 12, 2012). "Lionsgate's I, Frankenstein to Receive 3D Release". The Hollywood Reporter. Retrieved May 3, 2014. ^ Chitwood, Adam (April 2013). "Release Date Shuffle: I, Frankenstein Pushed to January 2014, Insidious 2 Moved Up, Austenland Set for 8/16, Walk of Shame Opens 9/20/". Collider.com. Retrieved February 28, 2014. ^ Canada NewsWire (September 17, 2013). "Lionsgate and Lakeshore's I, Frankenstein Rages into IMAX Theatres Across the U.S. Starting January 24, 2014". Digital Journal. Retrieved February 28, 2014. ^ "I, Frankenstein 3D Blu-ray". Blu-ray.com. Retrieved May 11, 2014. ^ "I, Frankenstein". January 24, 2014. ^ "I, Frankenstein". Metacritic. Retrieved January 25, 2014. ^ a b Anita Busch (January 27, 2015). "BOX OFFICE: 'Ride Along' & 'Lone Survivor' One-Two Punch For Universal; 'Nut Job' No. 3; 'I, Frankenstein' Not Alive". Deadline Hollywood. Penske Media Corporation. Retrieved June 16, 2015. ^ Anita Busch (January 27, 2015). "International Box Office UPDATED: 'Frozen' Crosses $800M Worldwide; 'I, Frankenstein' Strong In Russia; Battle Underway In China For No. 1". Deadline Hollywood. Penske Media Corporation. Retrieved June 16, 2015. ^ Philbick, Jami (January 21, 2014). "IAR Exclusive Interview: Kevin Grevioux Talks I, Frankenstein, A Possible Sequel and Crossover with the 'Underworld' Franchise". I Am Rogue.com. Rogue. Retrieved February 28, 2014.